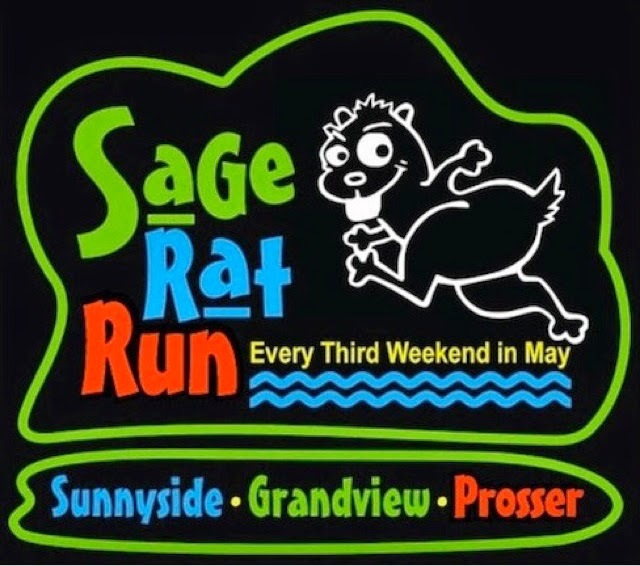 Spoiler alert: the Sage Rat Run weekend was one of the nicest race-cation trips ever! Nice courses, really well organized races, tasty and abundant real food at the finish, great shirts, amazing medals, and super nice people. Seriously. 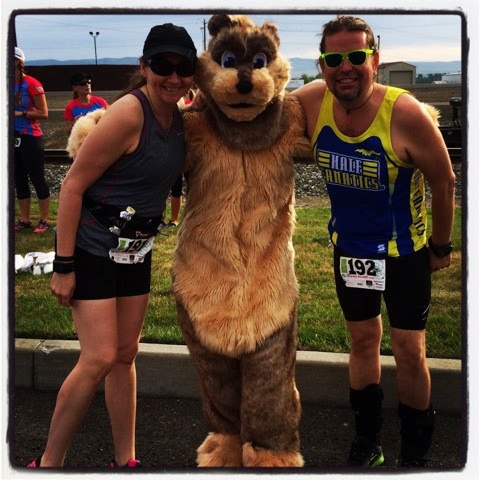 Run one or more of the races they put on for this weekend. 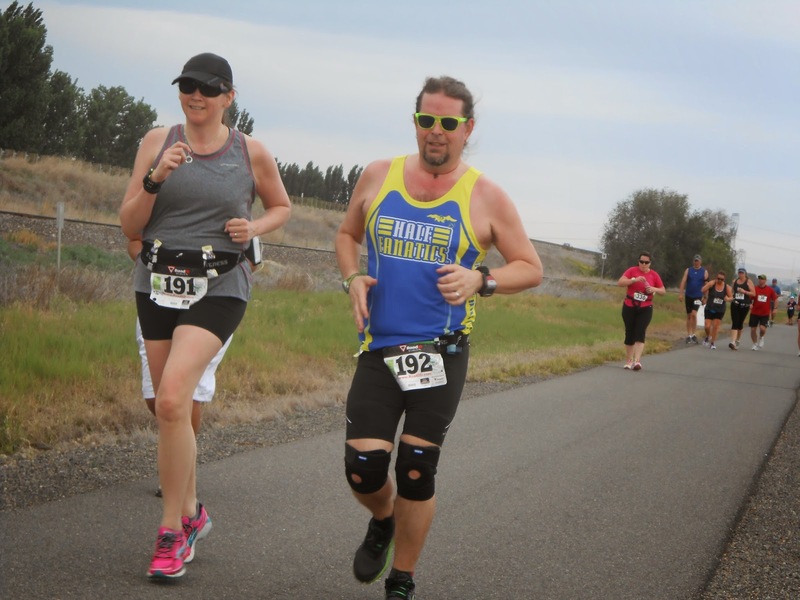 We drove from Seattle to Sunnyside on the Friday night after the Brooks "future of running" 100th anniversary party. Walked in to the Best Western Grapevine Inn at about 10:30pm and were warmly greeted and speedily checked in. 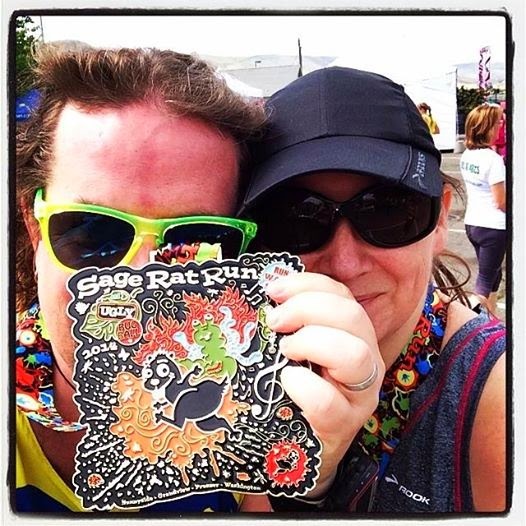 The manager asked whether we were "Sage Rat Running" the next day, and then helpfully told us that the start was about a quarter mile away. Handy! I don't often stay in official race hotels, but this has made me think I should ALWAYS do that! Because the race started at the civilized hour of 8:00 a.m., we were able to enjoy the hotel's very nice breakfast before heading out. Lord knows I love waffles. And hard-boiled eggs. Being us, we left absurdly early, and drove the 4 minutes to the Walmart parking lot to pick up our bibs and shirts... which took all of two minutes to do. We were told to keep our bibs for day two, which was good to know (and smart and eco-friendly). **SHIRT LOVE** - the website said that the men's shirt would be "tactical black", while the women's shirt would be "some color my wife will choose". Now, anyone who has actually met me knows that a black race shirt is something of a holy grail for me. So OF COURSE I wanted the black shirt. I LOVED that I was able to select a men's-sized shirt when I registered. Oh, and as it happens, the women's color was a very handsome pumpkiny orange. Still, was thrilled to gents black shirt! 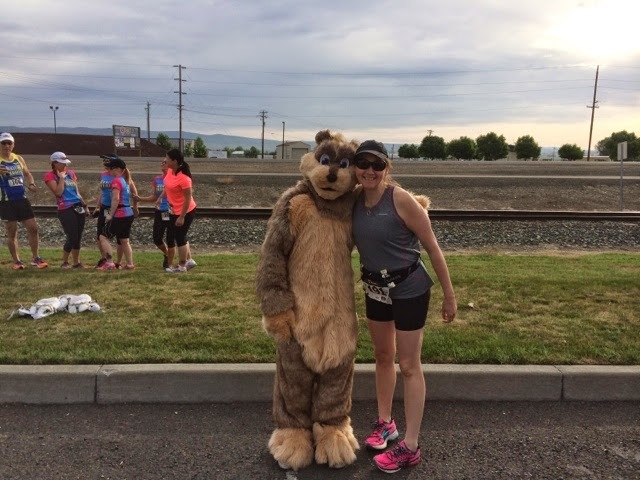 **MASCOT LOVE** - The Sage Rat Run had a MASCOT, a giant sage rat named Dusty. AWESOME. I mean, who does this????? Let me be absolutely clear: Dusty the Sage Rat is NOT a local school mascot. 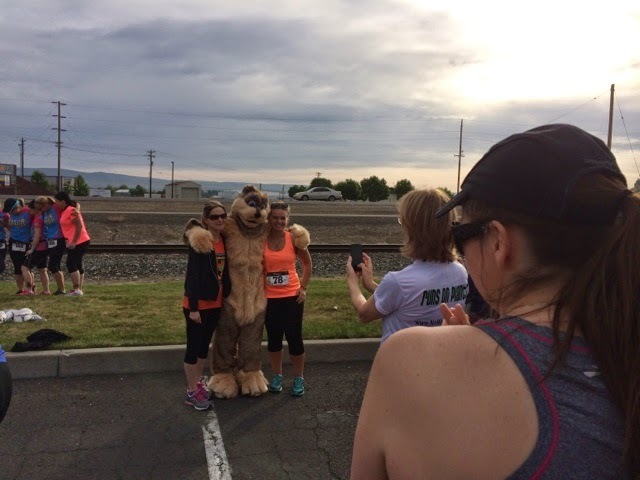 He is the race mascot. I mean, he doesn't even have a day job running a theme park. There was a brief course talk at 7:45, and then we headed the couple of hundred years to the start. I really had no idea what to expect, numbers-wise. But there were a few hundred of us, which felt like a very nice size. 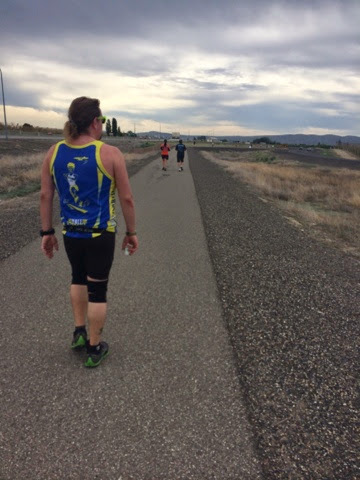 After a few minutes of milling around and chatting with our fellow runners (Wil got lots of attention in his Fanatics singlet) we headed out. 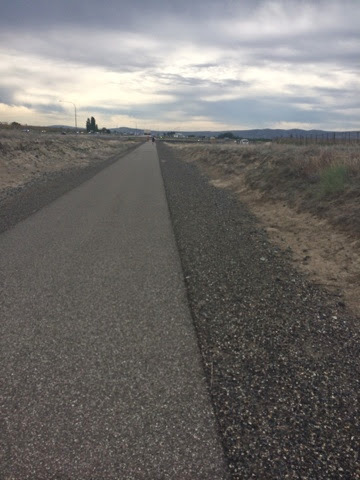 Much of the course was on a well maintained bike trail that runs from Sunnyside, through Grandview, and on to Prosser. 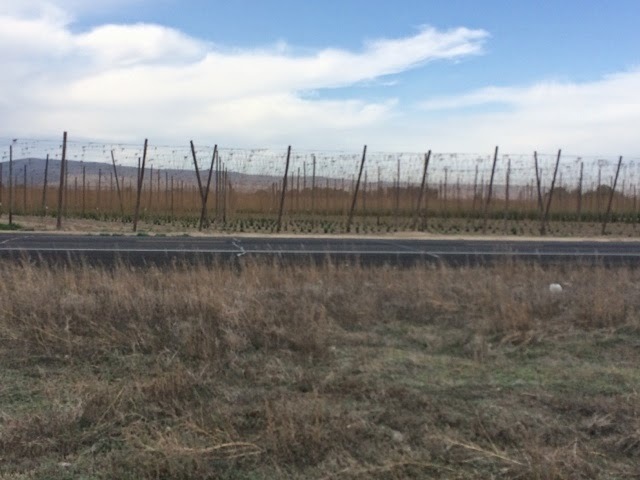 It was described as "not scenic" because much of it is sandwiched between the interstate and a 2-lane highway... but I thought it was plenty pretty. 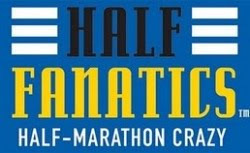 The goal for the half marathon, frankly, was to finish and get the medal. 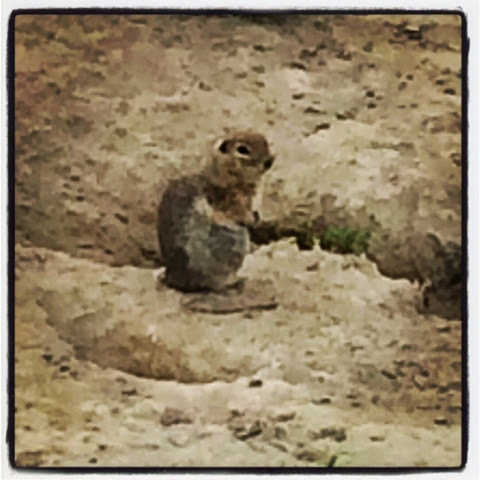 The stretch goal was to see a sage rat in the wild. GOOOOOOOOOOOOOOALLLLL!!!! 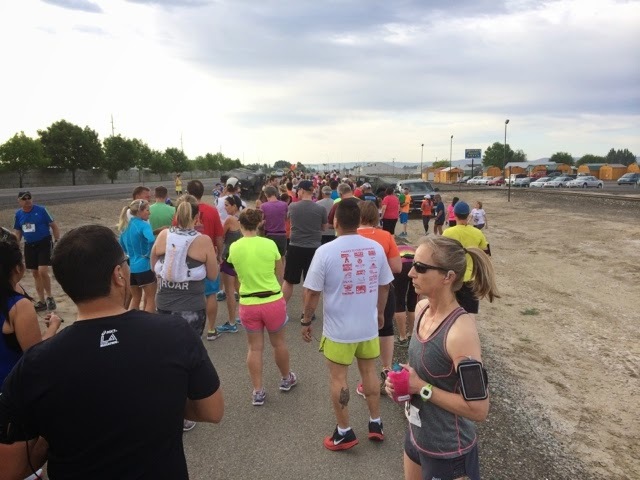 We had decided before the race that we would run to the halfway point and then walk the rest of the way. We are starting to have pre-Peru paranoia, so we are trying to stay healthy. No sense knocking ourselves out now! Any time we had to cross a street, small or large, one or more local police were there, all super friendly and very appreciative. Even when we headed through downtown Grandview and had to cross the 2-lane highway, they were doing a great job of managing traffic. 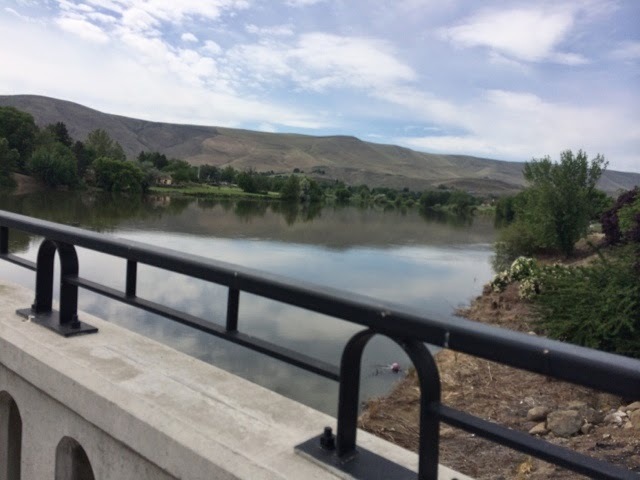 Eventually we arrived on the outskirts of Prosser, a super cute little town on the Yakima River. Yep, I included a 6-inch ruler in the picture just to make it clear that this baby is HUGE. And gorgeous, and very, very custom. We were handed cups of ice water (nice touch!) and made our way to the party. **POST RACE FOOD LOVE** - in addition to an abundant supply of bagels, orange wedges, bananas, and I may have even glimpsed PBnJ sammies, each runner was given a slice of pizza and a donut. Distribution was controlled in a simple, but totally effective manner: little "bug" stamps on the race bibs, which got scribbled on when you picked up your food. No one got shorted on food, and no one took more than their fair share. Also, the donuts were blueberry cake donuts, being made fresh right there. Nice! 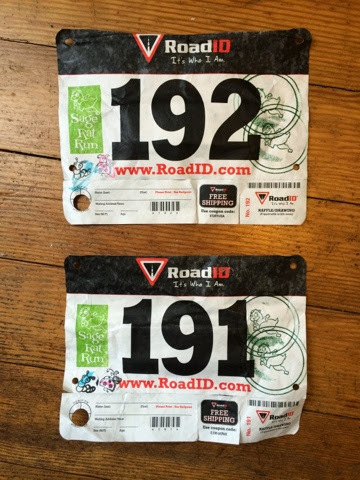 **ORGANIZATION LOVE** - Rather than buy custom bibs, the organizers got Road ID bibs and customized them with stamps. I'm not sure whether they used different colors for the different events, or went off numbers to distinguish between the half, 12K, 10K, 5K, etc. 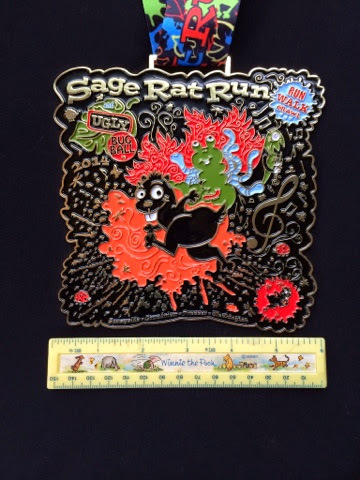 you can see the two little bugs (with highlighter scribbles) in the lower left for post-race food; we also have the "Rat Deux" (two sage rats) on the right. Super super smart! We hung around for a while chatting, but then decided to get on a shuttle back to the start. I am sorta wishing we had stayed longer in Prosser, though we did go back and spend the afternoon there after going back to the hotel and napping and showering. 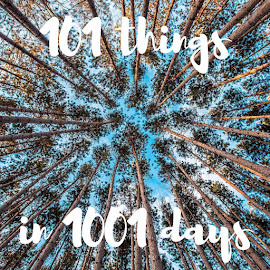 All in all an awesome event - and this was just day one! Inca Trail Adventure : one month away!! !